Illustration created by L. R. Maxwell exclusively for OOak - Just For You! These mugs feature an African American ballerina, tennis player or a karate kid. (11 oz white ceramic mug with colored interior and handle). NOTE: You have the option to personalize your mug by adding a name. If you do not want to add a name please type "N/A" in the space that asks for a name. $6.50 shipping Tah-Dah ..... I'm A Survivor Mug - As I watched my own Mother go through all of the ups and downs of Breast Cancer Treatment, I could never the right thing to cheer her up. I created a line of cards for her, and she loved them all. So now, I'm using those images on mugs for others to share a NOT SO TYPICAL kind of humor with their loved one. These images are totally personalized from hair color, style, skin tone, breast firmness (LOL) and a name. While we do NOT find the treatment process to be humorous at all, we do know that laughter can sometimes be the medicine for our loved ones. Your design will come on a white 11oz white mug. $6.50 shipping fee fill show up at check-out. Add name for addt'l fee "Give a girl the right pair of shoes, and she can conquer the world". This file created exclusively by OOak, created just for you. Celebrating our military women who have transitioned from combat boots to pumps. Available in a variety of colors, if I've not listed a color that you'd like please email me. 15 oz white ceramic mug comes in a nicely packaged white gift box. White ceramic mug illustrated exclusively by L R Maxwell for OOak - Just For You! Daddy's shoes along with the shoes of his child in pink sneakers, pink ballerina slippers or blue sneakers. 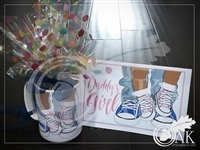 Personalized on the back with words of your choice and year that he became a Daddy:-) African American female with braids or natural hair mug designed exclusively by L. R. Maxwell at OOak - Just For You! Provide us with your name, grad cap color, school colors, school name and we'll do the rest. 15oz white mug can be filled with pencils, pens or your graduates' favorite treats. NOTE: Sorority letters can be added to front of Grad cap. $6.50 shipping "Never underestimate me, that'll be your first mistake" This 15 oz white mug is designed with original artwork from OOak - Just For You! showcasing a very powerful Black woman. Inspired by notable Black History icon. Black women have contributed so much, and continue to break barriers. Add your profession (or name), be proud! If you DO NOT want to add a profession / name please type in "n/a", do not leave this area blank. Your Time Is Up mug created by L. R. Maxwell, exclusively for OOak - Just For You! We can find inspiration in the most unlikely places. Where there's smoke there's fire. It's a new day! Add name for additional fee Black Girl Magic mugs for her. All white 15oz mug for your java. Get one for yourself or to share with a friend, family or co-worker. $6.50 shipping Rooted mugs for her. All white 15oz mug for your java. Choose between 2 diff designs or choose both, get one to share with a friend, family or co-worker.